Remove the drumstick and thigh by pressing the leg away from the body of the bird. The joint connecting the leg to the backbone will often snap free, or may be severed easily with a knife point. 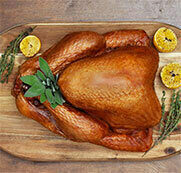 Cut the dark meat completely from the body by following the body contour carefully with the knife. Place the drumstick and thigh on a separate plate and cut through the connecting joint. Both pieces may be individually sliced. Tilt the drumstick to a convenient angle, slicing towards the plate. Hold firmly onto the plate with a fork. Cut even slices parallel to the bone. Place the knife parallel and as close to the wing as possible. Make a deep cut into the breast, cutting right to the bone. This is your base cut. All breast slices stop at this horizontal cut. Carve downward, ending at the base cut. Start each new slice slightly higher up on the breast. Keep slices thin and even.